The "S2H2" means they've actually removed weight from the hosel to be used elsewhere. This way, they can pack more weight in the rear of the driver to raise the MOI. The HFT extends the hitting surface to cover the entire hitting surface and creates a bigger sweet spot. Callaway creates the HFT by using chemicals to mill the clubface. Thus, you get higher ball speeds across the entire face of the club, creating a very forgiving driver where mishits will go almost as far as shots hit right on the middle of the face. If you are Callaway fan, I recommend you check out the Lady Diablo Edge. I like this one a little bit more. It has the same technology in a better-looking, traditionally-shaped clubhead. 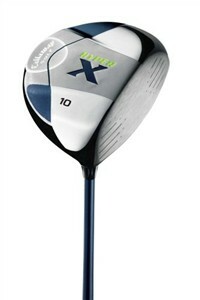 I also like the TaylorMade Lady R9 Supertri Driver because you can adjust the driver head to your swing. Adjust it closed to help you square the driver, and after you improve, adjust it back to neutral.